Housing and equity are major issues in New Orleans as are preserving the traditions that make the city unique. APA, the New Orleans Planning Commission, and HousingNOLA worked with area stakeholders, civic groups, and others to organize a workshop that focused on specific issues and goals related to preserving community identity and increasing affordable housing. 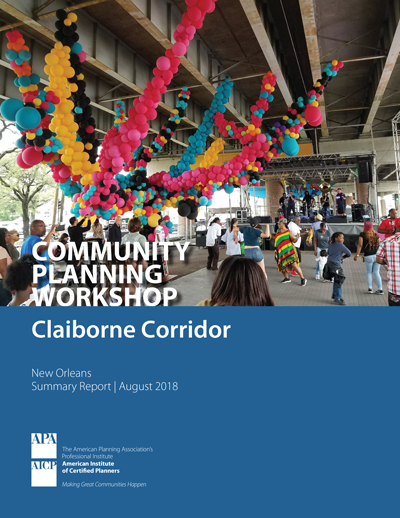 The 2018 Community Planning Workshop — held in conjunction with the 2018 National Planning Conference — focused on the Claiborne Avenue corridor, which covers the entire width of New Orleans and has citywide and regional importance. Demographic change since Hurricane Katrina in 2005 is generating both economic and cultural effects. The workshop focused on the topics of tiny houses and accessory dwelling units and parking in the context of finding solutions to the affordable housing crisis in the city. Twenty visiting planners from around the country — along with neighborhood residents, developers, business owners, government officials, and other local stakeholders — all brought a variety of perspectives to the day’s conversations. HousingNOLA has worked to ensure that equity is at the center of discussions with the community and reflected in the language of planning documents. Addressing affordable housing intersects many issues and requires a holistic approach.